If you are a dealer in a casino, chip box and different brands of playing cards must be will be familiar to you. 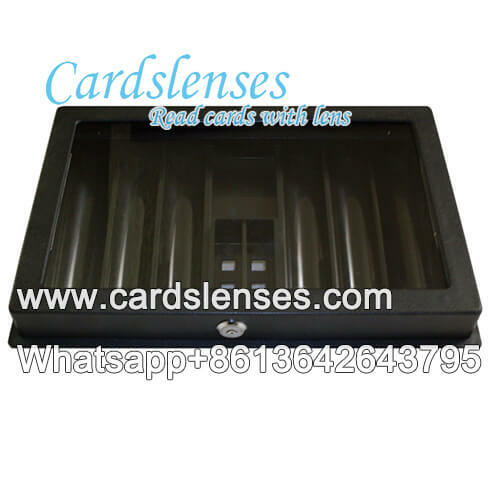 If you want to win money with these familiar things, you can try our poker scanning HD camera chip tray. And this chip tray can hold 500 chips. When I see the words poker scanner, playing cards with hidden barcode marks and poker predictor system will emerge in my mind, as well as the eavesdrop earpiece which is used to receive the final scanning outcome. This 350 chips box poker scanning HD camera is improved from the first design poker cheating chip box scanner. This 350 chip box poker barcode scanners are have two HD cameras. So, it will be more quickly when it scans the barcode marks on the playing cards. And the advantage of using double scanner is expanding the scanning distance. No matter in the distance of front and back, up and down, or the distance in left and right are all extended.